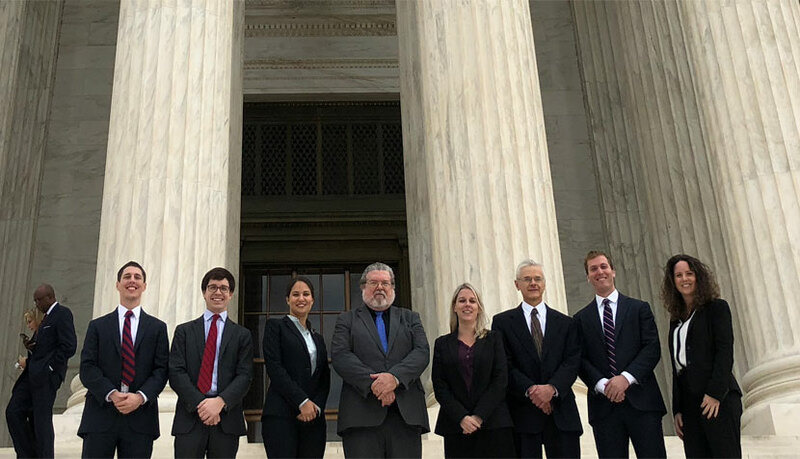 This yearlong clinic introduces third-year students to all aspects of current U.S. Supreme Court practice through live cases. This yearlong clinic will introduce third-year students to all aspects of current U.S. Supreme Court practice through live cases. Students earn eight credits (four credits graded on a CR/NC basis awarded in the fall for work done in the fall and possibly the summer and four credits graded on a graded basis for work done in the spring). The graded credits, although awarded for work in the spring, will reflect each student’s performance over the whole year. Working in teams, students will handle actual cases from the seeking of Supreme Court review to briefing on the merits. Classes will meet every week to discuss research memos, drafts of briefs, and other papers students have prepared for submission to the Court. Students will be expected to help identify candidates for Supreme Court review; draft petitions for certiorari, briefs in opposition, amicus briefs, and party merits briefs; and attend mootings and Supreme Court arguments. Students interested in the clinic should consider attending the public information session on Monday, April 8, 2019, in SL 290 at 4 p.m. Those who wish to enroll must complete an application form, attach the requested documents, and submit them via e-mail to Ms. Karen Sowers (ksowers@law.virginia.edu) no later than Monday, April 15, 2019 at noon. Applications received after this date will be placed on a waiting list; these students will only be eligible for consideration if openings arise. Once enrolled, NO drops will be permitted. Admitted students may be required to complete a little work over the summer before the clinic begins.